Note- This is an attempt to write about some of my favorite Sawan/monsoon songs looking at the season in totality. Also considering that the usage of words like Sawan/Barsaat/Baarish etc have been quite a lot in Hindi cinema, this post is only focusing on songs with the prominent usage of Sawan in it. For most Mumbaikar’s traveling by the local train gives rise to lots of activities, depending on the time that one can have on hand. Generally I tend to use such time available to read a book or a magazine. Sometimes of course the mind also wanders and I try to make use of it by getting to come up with things to write about later. So while thinking about the heavy rains seen in Mumbai last Sunday (but the rains this year have been disappointing overall at least in Mumbai) I started thinking of rain related songs from Hindi films (as most of us do year on year) and realized that there have been quite a few compilations of rain songs done by people over the years. 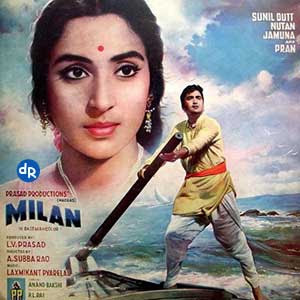 This classic song symbolizing a music lesson being taught by Gopi (Sunil Dutt) to Radha (Nutan) is something that most of us must have heard umpteen times in our formative years. Since I am a late 70’s product myself I was never too fond of this song initially. But all that changed I guess after the parody song in Mr.India (Sorry didi ab hum nahin karenge shor) made me look back at the song with a lot more care and respect. Sung wonderfully by Mukesh and Lata Mangeshkar to the tune composed by Laxmikant-Pyarelal and with lyrics composed by none other than Anand Bakshi, the song is beautifully picturised as well. Milan is a remake of the director A.Subba Rao’s own superhit Telugu film, Mooga Manasulu. This is one of the less frequently heard Sawan based songs and I’m sure not many of us might remember the video but it’s possible that a lot of us would maybe be aware of the new version of the song seen in Dil Vil Pyar Var (2002) a film which featured 16 popular songs composed by R.D.Burman in various films but re-arranged by Babloo Chakravorty here. The new version sung by Babul Supriyo and Sadhna Sargam definitely is no match to the original song composed by R.D.Burman and sung effortlessly by Lata Mangeshkar and Kishore Kumar ( with lyrics by Anand Bakshi once again ). The song is shot in the rain and features Jeetendra and a very young Reena Roy (one of her earlier films). 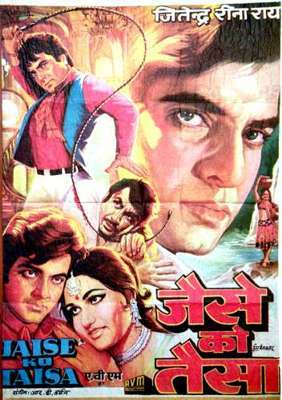 For those who haven’t heard of the film let me tell you that it is a story of twin brothers ( Jeetendra ) who get separated during their childhood and go on to lead contrasting lives. For those interested let me also tell you that the film was directed by Murugan Kumaran who was known for directing & producing Hindi films mainly remade from Tamil. “Ab ke sawan mein ji dare,rim jhim tan pe paani gire,mann mein lagi aag si”– Do check out the song which still sounds so fresh. Now this is one song which I’m sure all of us must have heard of umpteen times. 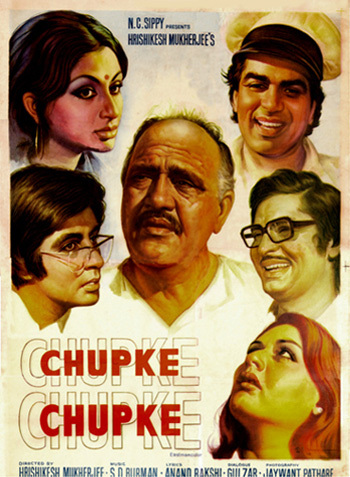 That Chupke Chupke is one of the best comedy films in Hindi Cinema is a fact known to all of us. It was a landmark film made by Hrishikesh Mukherjee who had this special knack of getting top stars to work with him on films that were down to earth and typical slice of life kind. Chupke Chupke is easily one of the best performances of Dharmendra who was outstanding as the Botany Professor Parimal Tripathi. There is of course no rain depicted in the song as its picturised indoor with Sharmila Tagore singing before a small audience at home. But what makes the song even more special is that Dharmendra in the guise of the driver is hiding behind the curtain and listening to the song while Sharmila Tagore seems to be having a lot of fun. A suspicious Om Prakash and a samosa munching Asrani only make the song even more charming. Composed by S.D.Burman and sung by Lata Mangeshkhar, the lyrics are by Anand Bakshi. 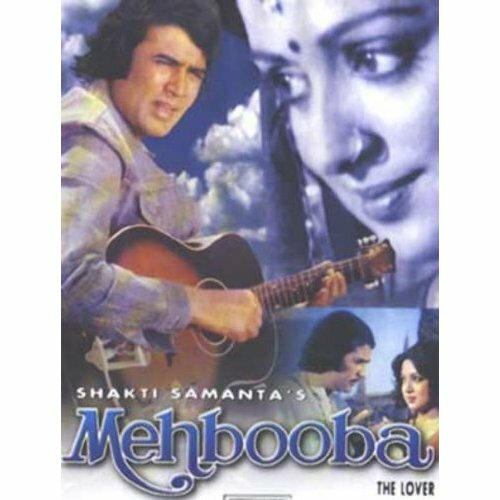 Mehbooba was a reincarnation film with Rajesh Khanna and Hema Malini in the lead. Directed by Shakti Samanta who had worked a lot with Rajesh Khanna, the film didn’t really work commercially. But the songs composed by R.D.Burman were popular and this song in particular is a very popular Kishore Kumar hit. There is a even a female version of the song (sung by Lata Mangeshkar ) in the film. And the lyrics are again by Anand Bakshi, no wonder he was such a prolific lyrics writer. As much as the song is lovely the video is also a lesson for aspiring filmmakers. Check out the song and you’ll make out that either there was no continuity A.D on the sets or that he/she did a lousy job over here. Less than half way into the song the location abruptly shifts from outdoor to indoor (a bad set being passed off as the natural external location) and the costumes of Rajesh Khanna and Hema Malini also change ( check out his trousers/jeans and also his vest ) 🙂 . However the song is deeply romantic and still retains its charm and that’s why it makes it to my list. All those who are Bollywood enthusiasts here would know that Rajshri Productions always stood a little different from other production houses. They were not just into production but also had a well established distribution network spread across the country through which they distributed not only their own films but also that of others. When it came to their productions the underlining rule was clear-the films had to be family oriented and definitely within a very comfortable budget. This was the trend which they followed well into the 80’s around the time when they really went broke & then they had a rebirth with Sooraj Barjatya turning around the tide with Hum Aapke Hain Kaun. So keeping in line with their underlining rule in the 60’s, 70’s & 80’s the focus was always on having a family drama (an Agent Vinod was an odd exception) and the dependence on big stars wasn’t there. Another thing that the films kept in mind was the music had to reach out to the masses but with an emphasis on melody. Basu Chatterjee ‘s Manzil is again a reminder that both Basu Chatterjee and Hrishikesh Mukherjee stood out from the rest of the Bollywood brigade in the way they stood rooted and made slice of life films, mostly revolving around the middle class. Like Hrishida even Basu Chatterjee could manage to work with stars whenever needed. 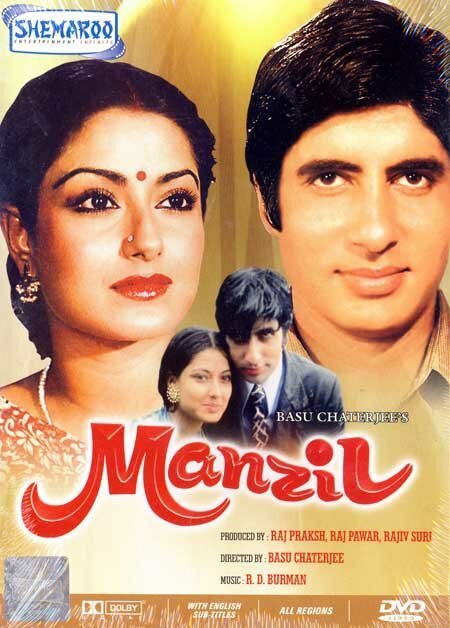 Manzil had Amitabh Bachchan as Ajay Chandra, a normal youngster with dreams in his eyes. Ajay falls in love with Aruna (Moushumi Chatterjee) and pretends to be a rich man in front of her family to impress them. Ajay is not a bad guy, he thinks he can succeed in his business before the wedding and make his dreams come true only to face hurdles one, after the other. I remember being impressed with the film when I saw it as a kid on Doordarshan. I was fascinated to see my hero Amitabh play a down to earth man who is a romantic and a dreamer. It was also interesting to note that unlike in most films here he wasn’t shown to be starting any vague ‘industry’ or establishment but the film clearly showed him doing something interesting- manufacturing scientific instruments. Watching Amitabh and A.K.Hangal (no I am not joking) testing ammeters and voltmeters was interesting because you hardly see such things in films. Rimjhim gire sawan is one of my all time favorite songs and the song clearly is an indicator of love being in the air. The occasion is a friend’s wedding and Amitabh sings the song to entertain the newly wedded couple and the other guests. Just before the song there’s a brief encounter between Amitabh and Moushumi which Moushumi keeps thinking about during the song. The song is composed by R.D.Burman and the lyrics are by Yogesh. While there is also a female version sung by Lata Mangeshkar, it is this male version sung by Kishore Kumar that I’m really fond of. Back in the 80’s Chitrahaar on Doordarshan used to be a program that most people looked forward to eagerly. This was the program where one got to see most of the new songs from Hindi Cinema and there were some songs which were so popular that they would keep getting repeated in various episodes and people would look forward to these songs. This song from Sindoor was again one such song. 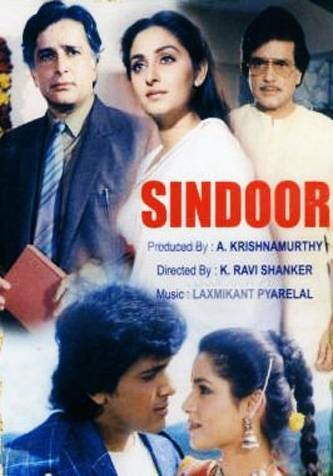 Directed by K.Ravi Shankar, Sindoor was a typical family entertainer of the 80’s with an ensemble cast comprising of Shashi Kapoor, Jeetendra, Govinda, Rishi Kapoor, Jayapradha, Neelam etc. Composed by Laxmikant-Pyarelal and written by their favorite lyricist, Anand Bakshi, the song featuring Shashi Kapoor, Neelam and Govinda ( in the background ) reminds you of how life was so simple back those days. Sung effortlessly by Lata Mangeshkar and Mohd.Aziz (who briefly occupied Kishore Kumar’s position in the late 80’s & early 90’s) the song is still soothing to the ears. Actually the song has multiple versions in the film with one of them being picturised on Rishi Kapoor and Jayapradha and sung by Lata Mangeshkar and Suresh Wadkar. To be honest when Chandni released I wasn’t all that enthusiastic about it. Maybe the triangular romance with 2 seniors like Vinod Khanna and Rishi Kapoor wasn’t all that enticing for me though I knew it was more a Sridevi film. But even then as a kid I still enjoyed the songs those days, if not the film itself. Of course in course of time I’ve also gone on to have respect for the film as well. Films like Chandni and Chaalbaaz in the same year showed how popular Sridevi was those days. This particular song is an all time favorite romantic number and picturised very well on Sridevi who is seen to be enjoying the rain and Vinod Khanna who is pouring his heart out through the song. The composer duo Shiv-Hari really worked well with Yash Chopra and this song is again another reminder of that aspect. Suresh Wadkar is one singer who hardly disappoints and even here he elevates the song to a large extent with his mellifluous voice. And it’s no surprise that this song has also been written by Anand Bakshi. Back in the early 90’s Gulshan Kumar and his T.Series rocked the music industry and thus quite a few films were made just on the basis of a hit music track. People like Nadeem-Shravan, Anuradha Paudwal, Kumar Sanu etc benefited largely due to this phenomena. One such film that came out during this time was Aayee Milan Ki Raat, a film with tantriks, snakes, magic etc : ) . Starring Avinash Wadhavan (remember him?) and Shaheen (she also did Mahasangram but does anyone else remember her in any other film?) the music by Anand-Milind was quite popular thanks to Doordarshan , Vividh Bharati, Radio Ceylon etc. This is a typical rain song sung by Mohd.Aziz and Anuradha Paudwal in full gusto. The song is nostalgic for me as it’s reminiscent of a special period- the early 90’s when I was slowly becoming a serious collector of audio cassettes as well. And I’m all the more curious to know if there’s anyone else here who has also seen the movie (because I certainly watched it : ) ). Dahek is one of those films which get ready and the audio release happens and the promos are aired too, just that these alone are not able to help the cause of a bad script and also a delayed release as well. 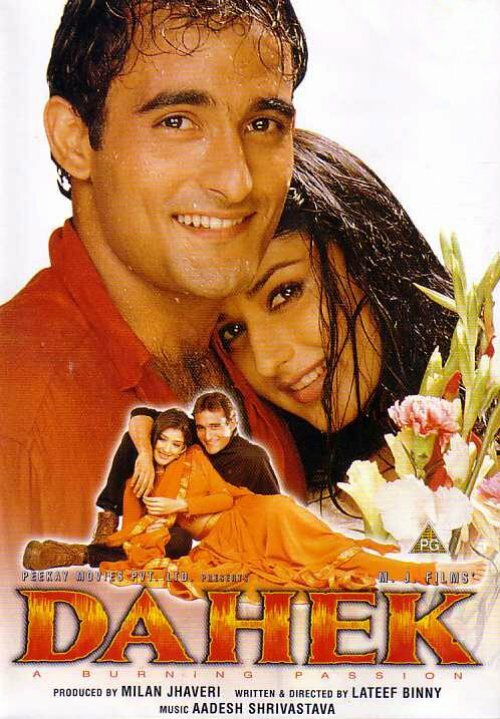 Starring Akshaye Khanna and Sonali Bhendre and directed by Lateef Binny, probably the only saving grace for this film is this lovely romantic track composed by Anand-Milind (guest composers for the film with Adesh Shrivastava having composed the other songs). Sung by Hariharan and Sadhana Sargam and written by Majrooh Sultanputi the song captures a rainy day in Mumbai and shows the lead pair who is in love and wanting to meet up in spite of the rain. What started off as a very small exercise in terms of recollecting a few songs centered around Sawan has gone on to become a fairly enormous post for 2 reasons- one there has been enough to write about these songs & the movies they belong too. And two- I have just let myself go footloose and fancy free in writing this without sticking to any conventions. So I hope you don’t mind going through this article and the list of songs chosen. It would also be great if you could let me know what your favorite monsoon songs are and if you feel I have left out any important song from the list. Note- I would also like to point out that if the list was not restricted to Hindi film songs then I would have gladly included 2 more songs- Ab Ke Sawan Aise Barse by Shubha Mudgal and Sawan Mein Lag Gayi Aag by Mika. Both the songs were trendsetters and quite popular some time ago. Of course Sawan Mein Lag Gayi Aag also featured in Hansal Mehta’s Woodstock Villa but the movie version of the song doesn’t really appeal to me at all. She Did It, Once Again!